Although you may not like smelling it when you pass cattle trucks on the highway, cow manure makes an ideal, nitrogen-rich supplement for plants. In fact, according to the Oregon State University Cooperative Extension, more than 50 percent of the nutrients that dairy cows consume actually leaves their bodies in the form of manure. While this may be bad news for dairy farmers trying to save money on feed costs, it provides a wonderful opportunity for gardeners to enrich their garden soil and produce healthy plants, vibrant blooms and a bountiful harvest. Cow manure contains a range of nutrients important to plant growth, including nitrogen, phosphoric acid and potassium. 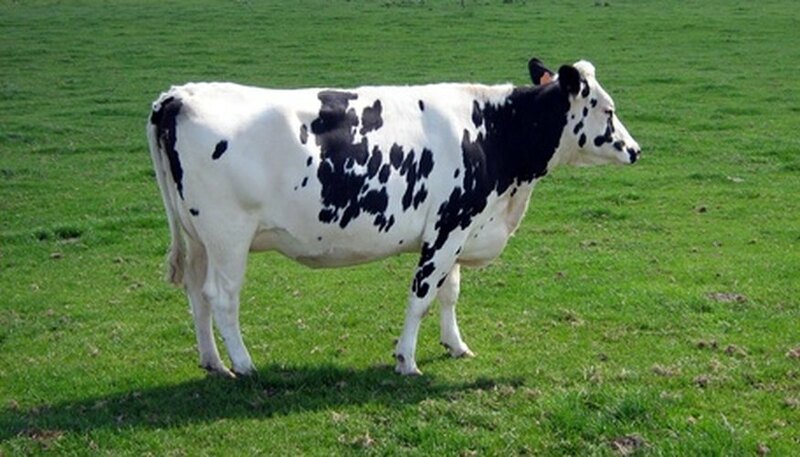 According to Oregon State University, a 1,400-pound lactating cow is capable of producing 300 pounds of nitrogen, 45 pounds of phosphorous and 165 pounds of potassium in her manure in just one year. The levels of nutrients in cow manure are lower than other animal manure used on plants, such as chicken and horse manure, so you’re typically able to use aged cow manure in virtually unlimited amounts without damaging your plants. Not all cow manure is created equal. According to Marion Owen, co-author of “Chicken Soup for the Gardener’s Soul,” manure from steers (castrated bulls) typically has a higher salt content and more weed seeds than the manure from dairy cows. If you purchase cow manure directly from a farmer, make sure you’re aware of how much bedding, urine and waste water is mixed with the manure, because that can significantly reduce the manure's nutrient value. Consider having the manure tested for nutrient values so you’re aware of the exact nutrient levels in the manure that you’re purchasing. Cow manure for plants can be good or bad, depending upon how quickly you add it to your garden. Never mulch your plants with fresh cow manure; plants in direct contact with fresh cow manure can quickly develop burns from the ammonia present in the manure. As a general rule of thumb, try to age fresh cow manure for at least six months before adding it to the soil around your growing plants. When you do add the manure, mix it into the soil thoroughly rather than just letting it rest on top. According to Washington State University Cooperative Extension, fresh cow manure may contain pathogens--such as E. coli and listeria--that could infect human beings. Wear gloves when handling fresh cow manure to eliminate direct contact with your skin. Avoid applying fresh manure to your food crops after you’ve planted them and always wash fresh vegetables thoroughly before eating them if you use cow manure on your garden. According to Constance Hardesty, author of “Grow Your Own Pizza,” the bagged cow manure sold at many home improvement and garden centers is a safe manure source because it’s already sterilized and composted (or aged). However, this type of manure can be expensive. Composting cow manure is a good management practice before adding it to your garden soil. Mix your cow manure with an equal amount of carbon-rich materials, such as dead leaves, shredded newspaper and dried lawn clippings, in order to provide the decomposing organisms with the correct balance of nitrogen and carbon for quicker composting. You should allow the compost to reach 150 degrees F in order to kill off any pathogens that may be in the manure.